Every year as my daughter’s birthday approaches, I cannot help but give thanks to God for all the blessings in my life. I know many people will read this and think “great, here goes another Christian dragging God where he does not belong”, and some might even be thinking “how dare he exploit his daughter to encourage delusional fairytales.” But as I look back over the course of my life, and particularly the past nine years, it is evident how God has been working all things together for good (Romans 8:28), and it all cannot be explained naturally. Nine years ago, there was nothing natural about the day my daughter was born, or the weeks, months, or years leading up to it. There were just too many things being orchestrated perfectly behind the scenes. Was it random that my then-wife and I could not have children? Was it random that every surgery, medicine, or attempt to have children failed? Was it random we were hundreds of miles from home in Philadelphia when I picked up a magazine that had a small segment about adoption? Was it random that we had exactly enough money and not a penny more to cover the adoption expenses? Was it random that just a few hours up the road at that exact same time there was a young girl trying to find a home for her unborn baby? Was it random that this young girl had absolutely no logical reason to choose us to parent her child? Was it random that every single moment on the day that my daughter was born could not have been scripted more perfectly? How many adoption stories do you hear where the birthmother’s family insist on you being in the room so you do not miss a moment of your daughter’s life? How many adopting fathers were the first person to ever hold their daughter? As I look back to the days leading up to July 7, 2009, I remain in awe at the myriad of events that went into the birth of a beautiful 6-pound 12-ounce 20-inch baby girl. I cannot think of any more reasonable explanation than an all-loving and all-sovereign God. To look at the birth of any child as merely random is simply closing our eyes, ears, and minds to self-evident facts. Are we really to believe that human beings can be reduced to unintended byproducts of time, matter, and natural laws? Are we really to believe that there is no reason or purpose for any of it? Are we really to believe that we can look into someone else’s eyes and think anything is more reasonable than that person being created in the image of God, whose very definition is love (1 John 4:8)? I recently asked my daughter what she thought about the Bible, and whether she thinks it really happened or was made up. She thought about it for a second and said, “I don’t think anyone could make up a story like that.” She is nine. But she gets it, and I am thankful she does, because I know she is part of a bigger story and that her life has meaning and purpose (Psalm 139:13-18). I could never adequately express the gratitude I have for a loving Father that entrusted this beautiful child into my care for now. I hope each and every one reading this takes the time to appreciate their blessings and uses it as an opportunity to give thanks back to the one from whom all things come (Romans 11:36; 1 Corinthians 8:6). If you are one of the ones wondering why I am putting God where He does not belong, I respectfully remind you that I am simply keeping Him right where He has always been. Choosing not to believe or ignoring it altogether does not change the facts. As they say, you are certainly entitled to your own opinion, but you are not entitled to your own truth. As someone who has examined the evidence, I encourage you to do the same, to objectively study your worldview and the Christian worldview, examine the evidence, and follow it all the way to the truth (John 14:6). You will find that the Christian faith is a historical, testable, and intelligent faith and does not depend upon blind faith. You will find that the Christian worldview shows the universe was created with order, logic, design, and truth, by a God powerful enough to create something out of nothing, with purpose and precision. What created your nothing? What is your purpose? No matter how hard we try, we simply cannot reasonably and consistently explain our existence away with randomness, evolution, naturalism, or another hybrid worldview. Will there be questions along the way? Absolutely. But that is why it is so important to ask the tough questions and work through them. Did God really create the universe? Why does God allow bad things to happen to good people? How do know we can trust what the Bible says? Did Jesus really rise from the dead? You may not find the perfect answer to every question, but if you are honest with yourself, does your worldview provide every answer to every question with sufficient evidence, or are you staking your eternity on waiting for answers to randomly present themselves? I believe it takes more faith to reject or ignore the evidence than it does to conclude that the Christian worldview is the most reasonable explanation. If you are struggling with questions like this, I hope you will consider digging deeper and joining me for Reasonable Faith this fall at Emmanuel Church in Greenwood. Reasonable Faith aims to provide an intelligent, articulate, and uncompromising yet gracious Christian perspective on the most important issues concerning the truth of the Christian faith, such as: the existence of God, the meaning of life, the objectivity of truth, the foundation of moral values, the creation of the universe, intelligent design, the reliability of the Gospels, the uniqueness of Jesus, the historicity of the resurrection, and the challenge of religious pluralism. If you are interested in attending please reach out to me for more details. I may not know you personally, but I am praying for each and every one of you. “I will give you a new heart and put a new spirit in you; I will remove from you your heart of stone and give you a heart of flesh” (Ezekiel 36:26). He was born in an obscure village, the child of a peasant. He grew up in another village, where he worked in a carpenter shop until he was thirty. Then, for three years, he was an itinerant preacher. He never wrote a book. He never held an office. He never had a family or owned a home. He didn't go to college. He never lived in a big city. He never traveled two hundred miles from the place where he was born. He did none of the things that usually accompany greatness. He had no credentials but himself. He was only thirty-three when the tide of public opinion turned against him. His friends ran away. One of them denied him. He was turned over to his enemies and went through the mockery of a trial. He was nailed to a cross between two thieves. While he was dying, his executioners gambled for his garments, the only property he had on earth. When he was dead, he was laid in a borrowed grave, through the pity of a friend. Twenty centuries have come and gone, and today he is the central figure of the human race. I am well within the mark when I say that all the armies that ever marched, all the navies that ever sailed, all the parliaments that ever sat, all the kings that ever reigned, put together, have not affected the life of man on this earth as much as that one, solitary life. I recently read an article by an atheist called Why Isaiah 53 Is Not About Jesus. I don't know the author personally; nevertheless, I have complete respect for anyone willing to examine their faith, and the Bible in particular. Unfortunately, we don't all reach the same conclusion for a variety of reasons, but it's a well thought out and well written article, and I enjoyed reading it, even though I disagree with the conclusion. The premise of the article is that Christians incorrectly conclude that Jesus is the fulfillment of Isaiah 53, doing so based solely on faith, not evidence. I think this article is written more so to Christians that use Isaiah 53 as the only proof for their faith, because the article does allude to the fact that Christianity is not undermined, regardless of who the prophecy refers to. With that said, even if Christianity is not undermined, I think it's too easy to look at something out of context, and provide alternative theories that seemingly could make sense. For example, I recently had a Muslim friend go to great efforts to prove his theory that it was in fact Lazarus who wrote the 4th gospel (the Gospel of John). In doing so, he provided reasons that it wasn't John the Apostle, then meticulously provided opinions and theories as to why it was Lazarus. The crux of his theory was that Jesus explicitly said He loved Lazarus (John 11:5), so it must have been Lazarus that was the disciple whom Jesus loved, even though we have clear written evidence as to who the disciples were. I have to say, this was one of the better conspiracy theories I've read. Not necessarily because it was believable, but it did make for an exciting didn't see that coming alternate ending. But ultimately it wasn't unique, the goal was to distract us from the obvious truth, and disprove authorship, authenticity, and authority of one of the Gospels, and to no surprise one of the Gospels written by an eyewitness to the life, death, and resurrection of Jesus. As already mentioned, I don't think the atheistic point of view of Isaiah 53 is trying to undermine the core beliefs of Christianity, but I still find that it's too easy to take something out of context and confuse matters that simply don't need confused. What I mean is that we can't just look at Isaiah 53 and call it a day. There's sixty-six chapters to consider in the Book of Isaiah, and when we examine the entirety of Isaiah, and the Old Testament, it takes very little effort to see that it preannounces Jesus Christ’s incarnation, His earthly ministry, His death on the cross, His second coming, and His eternal kingdom. If we search long enough we shall find upon every page of Scripture, standing somewhere in the shadow, the outline of the central Person of the Book – the Lord Jesus Christ. With the help of David Limbaugh's Finding Jesus in the Old Testament, we find a number of very clear prophecies throughout Isaiah, keeping in mind these are merely a subset of the fulfilled prophecies in Isaiah, let alone the entirety of the Old Testament. But these go to the heart of the matter in that we're talking about someone specifically, not a nation. The most amazing drama that ever was presented to the mind of man – a drama written in prophecy in the Old Testament and in biography in the four Gospels of the New Testament – is the narrative of Jesus the Christ. One outstanding fact, among many, completely isolates Him. It is this: that one man only in the history of the world has had explicit details given beforehand of His birth, life, death, and resurrection; that these details are in documents given to the public centuries before He appeared, and that no one challenges, or can challenge, that these documents were widely circulated long before His birth; and that anyone and everyone can compare for himself/herself the actual records of His life with those ancient documents, and find that they match one another perfectly. Does the prophecy make more sense in the context of an entire nation or a single person? Is it reasonable to conclude that the prophecy refers to Jesus, and if not, who does it refer to? Once we get through the prophecies we'll discuss whether Isaiah is in fact a trusted source. And he said, "Yes, go, and say to this people, 'Listen carefully, but do not understand. Watch closely, but learn nothing.' Harden the hearts of these people. Plug their ears and shut their eyes. That way, they will not see with their eyes, nor hear with their ears, nor understand with their hearts and turn to me for healing." This fulfills the prophecy of Isaiah that says, 'When you hear what I say, you will not understand. When you see what I do, you will not comprehend. But the people couldn't believe, for as Isaiah also said, "The Lord has blinded their eyes and hardened their hearts--so that their eyes cannot see, and their hearts cannot understand, and they cannot turn to me and have me heal them." All right then, the Lord himself will give you the sign. Look! The virgin will conceive a child! She will give birth to a son and will call him Immanuel (which means 'God is with us'). As he considered this, an angel of the Lord appeared to him in a dream. "Joseph, son of David," the angel said, "do not be afraid to take Mary as your wife. For the child within her was conceived by the Holy Spirit. And she will have a son, and you are to name him Jesus, for he will save his people from their sins." All of this occurred to fulfill the Lord's message through his prophet: "Look! The virgin will conceive a child! She will give birth to a son, and they will call him Immanuel, which means 'God is with us.'" He will keep you safe. But to Israel and Judah he will be a stone that makes people stumble, a rock that makes them fall. And for the people of Jerusalem he will be a trap and a snare. God warned them of this in the Scriptures when he said, "I am placing a stone in Jerusalem that makes people stumble, a rock that makes them fall. But anyone who trusts in him will never be disgraced." And, "He is the stone that makes people stumble, the rock that makes them fall." They stumble because they do not obey God's word, and so they meet the fate that was planned for them. This fulfilled what God said through the prophet Isaiah: "In the land of Zebulun and of Naphtali, beside the sea, beyond the Jordan River, in Galilee where so many Gentiles live, the people who sat in darkness have seen a great light. And for those who lived in the land where death casts its shadow, a light has shined." He is a light to reveal God to the nations, and he is the glory of your people Israel! And she will have a son, and you are to name him Jesus, for he will save his people from their sins." "Look! The virgin will conceive a child! She will give birth to a son, and they will call him Immanuel, which means 'God is with us.'" He will be very great and will be called the Son of the Most High. The Lord God will give him the throne of his ancestor David. And he will reign over Israel forever; his Kingdom will never end!" Jesus answered, "I tell you the truth, before Abraham was even born, I Am!" The Father and I are one." For in Christ lives all the fullness of God in a human body. Out of the stump of David's family will grow a shoot--yes, a new Branch bearing fruit from the old root. Out of the stump of David’s family will grow a shoot — yes, a new Branch bearing fruit from the old root. And the Spirit of the LORD will rest on him — the Spirit of wisdom and understanding, the Spirit of counsel and might, the Spirit of knowledge and the fear of the LORD. He will delight in obeying the LORD. He will not judge by appearance nor make a decision based on hearsay. He will give justice to the poor and make fair decisions for the exploited. The earth will shake at the force of his word, and one breath from his mouth will destroy the wicked. He will wear righteousness like a belt and truth like an undergarment. In that day the wolf and the lamb will live together; the leopard will lie down with the baby goat. The calf and the yearling will be safe with the lion, and a little child will lead them all. The cow will graze near the bear. The cub and the calf will lie down together. The lion will eat hay like a cow. The baby will play safely near the hole of a cobra. Yes, a little child will put its hand in a nest of deadly snakes without harm. Nothing will hurt or destroy in all my holy mountain, for as the waters fill the sea, so the earth will be filled with people who know the LORD. In that day the heir to David’s throne will be a banner of salvation to all the world. The nations will rally to him, and the land where he lives will be a glorious place. After his baptism, as Jesus came up out of the water, the heavens were opened and he saw the Spirit of God descending like a dove and settling on him. For he is sent by God. He speaks God's words, for God gives him the Spirit without limit. And in another place Isaiah said, "The heir to David's throne will come, and he will rule over the Gentiles. They will place their hope on him." But to the Son he says, "Your throne, O God, endures forever and ever. You rule with a scepter of justice. You love justice and hate evil. Therefore, O God, your God has anointed you, pouring out the oil of joy on you more than on anyone else." I will dress him in your royal robes and will give him your title and your authority. And he will be a father to the people of Jerusalem and Judah. I will give him the key to the house of David--the highest position in the royal court. When he opens doors, no one will be able to close them; when he closes doors, no one will be able to open them. He will bring honor to his family name, for I will drive him firmly in place like a nail in the wall. They will give him great responsibility, and he will bring honor to even the lowliest members of his family." But the LORD of Heaven's Armies also says: "The time will come when I will pull out the nail that seemed so firm. It will come out and fall to the ground. Everything it supports will fall with it. I, the LORD, have spoken!" "This is the message from the one who is holy and true, the one who has the key of David. What he opens, no one can close; and what he closes, no one can open: "I know all the things you do, and I have opened a door for you that no one can close. You have little strength, yet you obeyed my word and did not deny me. In Jerusalem, the LORD of Heaven's Armies will spread a wonderful feast for all the people of the world. It will be a delicious banquet with clear, well-aged wine and choice meat. There he will remove the cloud of gloom, the shadow of death that hangs over the earth. He will swallow up death forever! The Sovereign LORD will wipe away all tears. He will remove forever all insults and mockery against his land and people. The LORD has spoken! In that day the people will proclaim, "This is our God! We trusted in him, and he saved us! This is the LORD, in whom we trusted. Let us rejoice in the salvation he brings!" For the LORD's hand of blessing will rest on Jerusalem. But Moab will be crushed. It will be like straw trampled down and left to rot. God will push down Moab's people as a swimmer pushes down water with his hands. He will end their pride and all their evil works. The high walls of Moab will be demolished. They will be brought down to the ground, down into the dust. Then, when our dying bodies have been transformed into bodies that will never die, this Scripture will be fulfilled: "Death is swallowed up in victory. Therefore, this is what the Sovereign LORD says: "Look! I am placing a foundation stone in Jerusalem, a firm and tested stone. It is a precious cornerstone that is safe to build on. Whoever believes need never be shaken. Jesus looked at them and said, "Then what does this Scripture mean? 'The stone that the builders rejected has now become the cornerstone.' Everyone who stumbles over that stone will be broken to pieces, and it will crush anyone it falls on." As the Scriptures say, "I am placing a cornerstone in Jerusalem, chosen for great honor, and anyone who trusts in him will never be disgraced." Yes, you who trust him recognize the honor God has given him. But for those who reject him, "The stone that the builders rejected has now become the cornerstone." In that day the deaf will hear words read from a book, and the blind will see through the gloom and darkness. The humble will be filled with fresh joy from the LORD. The poor will rejoice in the Holy One of Israel. The blind see, the lame walk, the lepers are cured, the deaf hear, the dead are raised to life, and the Good News is being preached to the poor. Then Jesus told him, "I entered this world to render judgment--to give sight to the blind and to show those who think they see that they are blind." Look, a righteous king is coming! And honest princes will rule under him. Each one will be like a shelter from the wind and a refuge from the storm, like streams of water in the desert and the shadow of a great rock in a parched land. Then everyone who has eyes will be able to see the truth, and everyone who has ears will be able to hear it. Even the hotheads will be full of sense and understanding. Those who stammer will speak out plainly. For the LORD is our judge, our lawgiver, and our king. He will care for us and save us. You will conceive and give birth to a son, and you will name him Jesus. He will be very great and will be called the Son of the Most High. The Lord God will give him the throne of his ancestor David. And he will reign over Israel forever; his Kingdom will never end!" All honor and glory to God forever and ever! He is the eternal King, the unseen one who never dies; he alone is God. Amen. For at just the right time Christ will be revealed from heaven by the blessed and only almighty God, the King of all kings and Lord of all lords. On his robe at his thigh was written this title: King of all kings and Lord of all lords. And a great road will go through that once deserted land. It will be named the Highway of Holiness. Evil-minded people will never travel on it. It will be only for those who walk in God's ways; fools will never walk there. Lions will not lurk along its course, nor any other ferocious beasts. There will be no other dangers. Only the redeemed will walk on it. "Don't let your hearts be troubled. Trust in God, and trust also in me. There is more than enough room in my Father's home. If this were not so, would I have told you that I am going to prepare a place for you? When everything is ready, I will come and get you, so that you will always be with me where I am. And you know the way to where I am going." "No, we don't know, Lord," Thomas said. "We have no idea where you are going, so how can we know the way?" Jesus told him, "I am the way, the truth, and the life. No one can come to the Father except through me. Say to those with fearful hearts, "Be strong, and do not fear, for your God is coming to destroy your enemies. He is coming to save you." And when he comes, he will open the eyes of the blind and unplug the ears of the deaf. The lame will leap like a deer, and those who cannot speak will sing for joy! Springs will gush forth in the wilderness, and streams will water the wasteland. The parched ground will become a pool, and springs of water will satisfy the thirsty land. Marsh grass and reeds and rushes will flourish where desert jackals once lived. And a great road will go through that once deserted land. It will be named the Highway of Holiness. Evil-minded people will never travel on it. It will be only for those who walk in God's ways; fools will never walk there. Lions will not lurk along its course, nor any other ferocious beasts. There will be no other dangers. Only the redeemed will walk on it. Those who have been ransomed by the LORD will return. They will enter Jerusalem singing, crowned with everlasting joy. Sorrow and mourning will disappear, and they will be filled with joy and gladness. This fulfilled the word of the Lord through the prophet Isaiah, who said, "He took our sicknesses and removed our diseases." Then their eyes were opened, and they could see! Jesus sternly warned them, "Don't tell anyone about this." Then a demon-possessed man, who was blind and couldn't speak, was brought to Jesus. He healed the man so that he could both speak and see. Jesus felt sorry for them and touched their eyes. Instantly they could see! Then they followed him. And when she arrived home, she found her little girl lying quietly in bed, and the demon was gone. Listen! It's the voice of someone shouting, "Clear the way through the wilderness for the LORD! Make a straight highway through the wasteland for our God! Fill in the valleys, and level the mountains and hills. Straighten the curves, and smooth out the rough places. Then the glory of the LORD will be revealed, and all people will see it together. The LORD has spoken!" He is a voice shouting in the wilderness, 'Prepare the way for the LORD's coming! Clear the road for him!'" Isaiah had spoken of John when he said, "He is a voice shouting in the wilderness, 'Prepare the way for the LORD's coming! Clear the road for him! The valleys will be filled, and the mountains and hills made level. The curves will be straightened, and the rough places made smooth. John replied in the words of the prophet Isaiah: "I am a voice shouting in the wilderness, Clear the way for the LORD's coming!'" Yes, the Sovereign LORD is coming in power. He will rule with a powerful arm. See, he brings his reward with him as he comes. He will feed his flock like a shepherd. He will carry the lambs in his arms, holding them close to his heart. He will gently lead the mother sheep with their young. "I am the good shepherd. The good shepherd sacrifices his life for the sheep. He personally carried our sins in his body on the cross so that we can be dead to sin and live for what is right. By his wounds you are healed. Once you were like sheep who wandered away. But now you have turned to your Shepherd, the Guardian of your souls. "Look at my servant, whom I strengthen. He is my chosen one, who pleases me. I have put my Spirit upon him. He will bring justice to the nations. He will not shout or raise his voice in public. He will not crush the weakest reed or put out a flickering candle. He will bring justice to all who have been wronged. He will not falter or lose heart until justice prevails throughout the earth. Even distant lands beyond the sea will wait for his instruction." God, the LORD, created the heavens and stretched them out. He created the earth and everything in it. He gives breath to everyone, life to everyone who walks the earth. And it is he who says, "I, the LORD, have called you to demonstrate my righteousness. I will take you by the hand and guard you, and I will give you to my people, Israel, as a symbol of my covenant with them. And you will be a light to guide the nations. This fulfilled the prophecy of Isaiah concerning him: "Look at my Servant, whom I have chosen. He is my Beloved, who pleases me. I will put my Spirit upon him, and he will proclaim justice to the nations. He will not fight or shout or raise his voice in public. He will not crush the weakest reed or put out a flickering candle. Finally he will cause justice to be victorious. And his name will be the hope of all the world." He says, "You will do more than restore the people of Israel to me. I will make you a light to the Gentiles, and you will bring my salvation to the ends of the earth." The LORD, the Redeemer and Holy One of Israel, says to the one who is despised and rejected by the nations, to the one who is the servant of rulers: "Kings will stand at attention when you pass by. Princes will also bow low because of the LORD, the faithful one, the Holy One of Israel, who has chosen you." This is what the LORD says: "At just the right time, I will respond to you. On the day of salvation I will help you. I will protect you and give you to the people as my covenant with them. Through you I will reestablish the land of Israel and assign it to its own people again. I will say to the prisoners, 'Come out in freedom,' and to those in darkness, 'Come into the light.' They will be my sheep, grazing in green pastures and on hills that were previously bare. They will neither hunger nor thirst. The searing sun will not reach them anymore. For the LORD in his mercy will lead them; he will lead them beside cool waters. And I will make my mountains into level paths for them. The highways will be raised above the valleys. See, my people will return from far away, from lands to the north and west, and from as far south as Egypt." For the Lord gave us this command when he said, 'I have made you a light to the Gentiles, to bring salvation to the farthest corners of the earth.'" For God says, "At just the right time, I heard you. On the day of salvation, I helped you." Indeed, the "right time" is now. Today is the day of salvation. I offered my back to those who beat me and my cheeks to those who pulled out my beard. I did not hide my face from mockery and spitting. So Pilate released Barabbas to them. He ordered Jesus flogged with a lead-tipped whip, then turned him over to the Roman soldiers to be crucified. And they spit on him and grabbed the stick and struck him on the head with it. Then some of them began to spit at him, and they blindfolded him and beat him with their fists. "Prophesy to us," they jeered. And the guards slapped him as they took him away. So to pacify the crowd, Pilate released Barabbas to them. He ordered Jesus flogged with a lead-tipped whip, then turned him over to the Roman soldiers to be crucified. And they struck him on the head with a reed stick, spit on him, and dropped to their knees in mock worship. The guards in charge of Jesus began mocking and beating him. They blindfolded him and said, "Prophesy to us! Who hit you that time?" And they hurled all sorts of terrible insults at him. Then Pilate had Jesus flogged with a lead-tipped whip. See, my servant will prosper; he will be highly exalted. But many were amazed when they saw him. His face was so disfigured he seemed hardly human, and from his appearance, one would scarcely know he was a man. And he will startle many nations. Kings will stand speechless in his presence. For they will see what they had not been told; they will understand what they had not heard about. Who has believed our message? To whom has the LORD revealed his powerful arm? My servant grew up in the LORD's presence like a tender green shoot, like a root in dry ground. There was nothing beautiful or majestic about his appearance, nothing to attract us to him. He was despised and rejected--a man of sorrows, acquainted with deepest grief. We turned our backs on him and looked the other way. He was despised, and we did not care. Very early in the morning the leading priests and the elders of the people met again to lay plans for putting Jesus to death. Then they bound him, led him away, and took him to Pilate, the Roman governor. Then Pilate called together the leading priests and other religious leaders, along with the people, and he announced his verdict. “You brought this man to me, accusing him of leading a revolt. I have examined him thoroughly on this point in your presence and find him innocent. Herod came to the same conclusion and sent him back to us. Nothing this man has done calls for the death penalty. So I will have him flogged, and then I will release him.” Then a mighty roar rose from the crowd, and with one voice they shouted, “Kill him, and release Barabbas to us!” (Barabbas was in prison for taking part in an insurrection in Jerusalem against the government, and for murder.) Pilate argued with them, because he wanted to release Jesus. But they kept shouting, “Crucify him! Crucify him!” For the third time he demanded, “Why? What crime has he committed? I have found no reason to sentence him to death. So I will have him flogged, and then I will release him.” But the mob shouted louder and louder, demanding that Jesus be crucified, and their voices prevailed. So Pilate sentenced Jesus to die as they demanded. As they had requested, he released Barabbas, the man in prison for insurrection and murder. But he turned Jesus over to them to do as they wished. One of the soldiers, however, pierced his side with a spear, and immediately blood and water flowed out. He was oppressed and treated harshly, yet he never said a word. He was led like a lamb to the slaughter. And as a sheep is silent before the shearers, he did not open his mouth. But when the leading priests and the elders made their accusations against him, Jesus remained silent. "Don't you hear all these charges they are bringing against you?" Pilate demanded. But Jesus made no response to any of the charges, much to the governor's surprise. Then the leading priests kept accusing him of many crimes, and Pilate asked him, "Aren't you going to answer them? What about all these charges they are bringing against you?" The next day John saw Jesus coming toward him and said, "Look! The Lamb of God who takes away the sin of the world! Caiaphas, who was high priest at that time, said, "You don't know what you're talking about! You don't realize that it's better for you that one man should die for the people than for the whole nation to be destroyed." He did not say this on his own; as high priest at that time he was led to prophesy that Jesus would die for the entire nation. And not only for that nation, but to bring together and unite all the children of God scattered around the world. I will give him the honors of a victorious soldier, because he exposed himself to death. He was counted among the rebels. He bore the sins of many and interceded for rebels. Two revolutionaries were crucified with him, one on his right and one on his left. Two revolutionaries were crucified with him, one on his right and one on his left. And the scripture was fulfilled, which saith, and he was numbered with the transgressors. Two others, both criminals, were led out to be executed with him. When they came to a place called The Skull, they nailed him to the cross. And the criminals were also crucified--one on his right and one on his left. Jesus said, "Father, forgive them, for they don't know what they are doing." And the soldiers gambled for his clothes by throwing dice. He had done no wrong and had never deceived anyone. But he was buried like a criminal; he was put in a rich man's grave. As evening approached, Joseph, a rich man from Arimathea who had become a follower of Jesus, went to Pilate and asked for Jesus' body. And Pilate issued an order to release it to him. Joseph took the body and wrapped it in a long sheet of clean linen cloth. He placed it in his own new tomb, which had been carved out of the rock. Then he rolled a great stone across the entrance and left. "Look! I am creating new heavens and a new earth, and no one will even think about the old ones anymore. But we are looking forward to the new heavens and new earth he has promised, a world filled with God's righteousness. And the one sitting on the throne said, "Look, I am making everything new!" And then he said to me, "Write this down, for what I tell you is trustworthy and true." Remember, this is only a subset of the hundreds of prophecies we find in Isaiah, and just a fraction of the thousands we find in the Old Testament. But given this larger sample size, what makes more sense as you read each prophecy and when you look at them collectively? Was Israel born of a virgin, or was it Jesus? Was Israel born in human flesh to live among us, or was it Jesus? Was Israel the seed of Jesse, or was it Jesus? Was Israel the key of David, or was it Jesus? Did Israel heal the blind, deaf, needy, and sick, or was it Jesus? Was Israel the righteous king, or was it Jesus? Did Israel die for his sheep, or was it Jesus? Was Israel the light to the Gentiles, or was it Jesus? Was Israel scourged and spat on, or was it Jesus? Was Israel rejected by his people, or was it Jesus? Did Israel die for our sins, or was it Jesus? Did Israel remain silent when led to the slaughter like a lamb, or was it Jesus? Was Israel crucified with transgressors, or was it Jesus? Was Israel buried with the rich, or was it Jesus? You get the point. When given a full and complete context, it doesn't take much effort to come to the logical conclusion that we're talking about Jesus the Christ. Can we provide an alternative explanation to certain prophecies? Absolutely. But Jesus is the best explanation that consistently and reasonably fits all the prophecies. Concluding otherwise would be subjective at best, and delusional at worst. As to whether we can trust the prophet Isaiah is an entirely different conversation, but an important one Christians should be prepared to discuss. Because when skeptics read the prophecies of Isaiah they're likely left wondering if they were in fact written over 700 years before Jesus, or perhaps written after Jesus was crucified, making it only appear that He was the long awaited Messiah. For this we have to examine the historical facts. In 68 AD the Qumran region (West Bank of Israel) was populated by a group called the Essenes. The Essenes were a Jewish sect that resembled the Pharisees. They lived isolated from other societies and dedicated to self-denial. The Essenes are not directly mentioned in Scripture, although some believe they may be referred to in Matthew 19:11-12, Colossians 2:8, Colossians 2:18, and Colossians 2:23. One reason scholars believe the Essenes are a trustworthy source is because Josephus gave a detailed account of them in three of his books, listing them as one of the three sects of Jewish philosophy (along with the Pharisees and Sadducees). Josephus is considered a reliable source because he was born in Jerusalem shortly after Christ’s crucifixion, and became a Pharisee at the age of nineteen. Josephus later switched sides and received Roman citizenship and became a military commander in the Jewish resistance. Point being, had he not been a true historian, he would have gladly tried to stop the Jesus movement. The reason the Essenes are important to history is because they originated 200 years before Christ and disappeared from history after the destruction of Jerusalem in 70 AD. As you can imagine, this was an important time period for Jewish and Christian history because it covered the birth of Jesus, His earthly ministry, His death on the cross, His resurrection, the life of the disciples, and the destruction of the Temple. Of significance with the Essenes is the fact that they dedicated their life to preserving literary works of history. Of the 800-900 documents found, about 220 are books from the Hebrew Bible (Old Testament). The most common books found in the scrolls were Psalms and Deuteronomy. The remaining documents were other religious texts and a range of secular writings. These preserved copies allow scholars and historians to prove that the ancient texts remained untouched from the originals. When the Qumran region was attacked and burned to the ground by the Romans in 73 AD, the Essenes fled with whatever they could carry. For most this would have been their sacred scrolls. The scrolls were stored in jars to help protect them from deterioration. But because these jars were large and heavy, they hid them in nearby caves. The jars and scrolls remained hidden until their discovery over 2,000 years later in 1946. The Great Isaiah Scroll found during the excavation provides us with definitive answers to questions that skeptics previously challenged. Specifically when the prophecies of Isaiah were written and whether they were written by one author. One reason scholars conclude it was written by a single author is that the scroll wasn’t divided into three sections, but rather was one continuous twenty-four foot scroll with all sixty-six chapters. Furthermore, Jesus Himself affirms that the entire Book of Isaiah was written by Isaiah. Luke 4:17-19 records an occasion where Jesus stands up to read “the scroll of the prophet Isaiah”. Afterwards, Jesus rolled up the scroll, gave it back to the attendant, sat down and said “The Scripture you’ve just heard has been fulfilled this very day!” Jesus affirms that Isaiah is inspired and has been preserved since that passage is in the very last section of the book (Isaiah 61:1-2). From an apologetic perspective, this kind of evidence is why we can trust the Bible. The content of Scripture has a context, with real people and real places, and is supported outside of the Bible, as we find with historians like Josephus. These type of discoveries show that we have historical facts, not corrupted texts. Although evidence isn’t a prerequisite for our faith, the evidence certainly supports our faith. Yet, even without all evidence to answer every skeptic, the evidence is more than sufficient to say Scriptures are trustworthy and historically accurate. Finally, it’s important to remember that it’s not disrespectful to examine the claims of the Bible under a microscope. In doing so we reinforce our faith. Were it otherwise, the Bible would not say “Always be prepared to give an answer to everyone who asks you to give the reason for the hope that you have” (1 Peter 3:15). And how do we do that? We use God's mighty weapons, not worldly weapons, to knock down the strongholds of human reasoning and to destroy false arguments. We destroy every proud obstacle that keeps people from knowing God. We capture their rebellious thoughts and teach them to obey Christ. In other words, we trust God and His written Word, and we take every thought captive and make it obedient to Christ. Let me start off by saying that I am in no way licensed, trained, or certified to give counsel on this subject; however, this message has been written on my heart for a while. I can only write and share my personal experience. My hope is simply that my story is able to help someone who drifts upon it and needs to know they aren't alone. The image to the right is a painting by Eric Samuel Timm, who I had the pleasure to meet recently. I love what he has to say about hope. Hope becomes a reality when we execute it into reality. Hope isn't something we pray for. Hope is something we are to be. Thanks for the painting Eric. I cherish it, and admire the work you are doing for the Kingdom of God. For the past couple of years I've been on a crusade to change my life. Although there is now clear direction and purpose in my life, that wasn't always the case, even after I began my relationship with Christ. Maybe like some of you, I thought I could just kick back and set life to cruise-control after I said the prayer to accept Christ in to my life and be baptized; however, I learned the hard way that my journey and God's work in me was just beginning. My valley started with something we have all experienced — grieving a loss. In my case, it was the end of a four year relationship. I had been on the losing end of a few other relationships throughout my life, including a five year marriage, but for whatever reason, when those relationships ended, although there was disappointment and heartache, it was short-lived, and as they say "life goes on". The end of this relationship can best be described as chaotic. There was virtually no closure, for either of us, and it ended with us living 500 miles apart, and starting life over, yet again. The first month apart was relatively uneventful. But as Thanksgiving came and went, and another Christmas season was looming, I found myself more lost than ever, incredibly lonely, and seeking. For right or wrong, I reached back out to my ex, in hopes of reconciling before we grew further apart. In my head, it was that simple. But there was one thing I hadn't planned for. The time I had spent planning for reconciliation, she had spent moving on, and meeting someone else. Ouch! This particular relationship however, was designed to crash and burn. It's easy to recognize that in hindsight. It started too quickly, progressed too quickly, and didn't have a foundation in Jesus Christ. That made everything from the way we communicated, to the way we parented, to our idea of quality time together, a minefield of broken dreams — and by the end I'm fairly certain we had set everyone one of them off. God's light came into the world, but people loved the darkness more than the light, for their actions were evil. I'm not sure if the downward spiral from this news was a jealous reaction, or simply having to accept and grieve the loss finally — I'm sure it was a combination of both. But what transpired over the next several months, were the darkest days I have ever experienced. Let's be clear, this valley didn't involve drugs, alcohol, or any other kind of substance abuse. I didn't need any. There was already a fog of depression that cluttered my mind 24-hours a day, every day, every night, without relenting. I parented still of course. I worked still. I continued to function, at least to the outside world, but I felt lost, with no purpose, and each minute that I existed seemed worse than the previous. To say I had reached the depths of depression would not give justice to what I was feeling. I know what you're thinking — over a breakup? Yes, over a breakup! You see, my priorities were a mess. I wasn't walking close to Christ — that journey had started, but it was still one-sided at this point, and I wasn't being intentional about pursuing Jesus in my life. On top of that, I was weening myself off a lifetime of idolizing the wrong things. So this loss was more than just a breakup to me, it was the loss of what I had convinced myself was the most important thing in my life. I don't need anyone to tell me how warped my thinking was. That was part of the disease, the depression, and the vicious cycle that I had allowed in to my life. Nights were the worst. It didn't matter what I did during the day. When the sun set, Satan would pull up a chair, and get to work. He buried me under the weight of my failures. All I could do was cry myself to sleep in utter exhaustion, in prayer, hoping it would all just be over in the morning. All I could think was... Lord, can you hear me? Why do I have to live through this pain over and over and over again, every day, and why can I think of nothing else but ending my life? Is that really what I'm supposed to do? In somewhat of a desperate move, I asked my counselor, and my doctor, if I could stop taking the medication. It's hard to explain why, but I felt like God was telling me I needed something else — perhaps a miracle at this point. They agreed to stopping the medication, and I couldn't get rid of it fast enough. The first several days letting my body adjust was unexpectedly more difficult than I thought. My mood swings and depression were all over the place. The highs were short-lived, and the lows were drawn out and the darkest few days I've ever known. Proceed with caution! This is where the tide turned; however, this is also where I hit my rock bottom. It was a Wednesday night, I was alone, and Satan brought everything he had at me. I'm talking a full onslaught of hate, and evil, and tearing me down. I gave up. I accepted that he was right. I was worthless, and no one, and I mean no one, was going to pull me out of it this time. Satan showed me the way out, and I conceded — my life is over. I collected my thoughts, and got my affairs in order. My last will and testament was already prepared. I had a password document ready for my brother so he could access all my files and accounts. I even had put together documentation and instructions for work with everything they would need to keep projects moving without me. There was only one thing left to do. Say goodbye to everyone. I continued to cry out to the Lord, still on my knees sobbing in the dark. I'm so tired. I can't do this life alone anymore. I'll follow You wherever You call me. I surrender all of it to You. All of it. Come burn every part of me Lord. Come fill me with Your spirit, and be a shield of protection around me. My life is Yours Lord, do with it as You wish. I won't try to save myself any longer — I can't — instead I trust solely in You Lord. This became more than just an anthem in my life. This became a continual reminder that our God is real. I cried out, and He listened. He lifted me out of despair, and He stood with me in the fiery furnace of Satan's war against me, and provided the comfort I had desperately prayed for. I died to myself that night. I truly believe that. I also believe that it's no longer I who lives, but Christ who lives within me. That next morning was the first day of my new life. The first thing I did was shred every last one of those goodbye letters I had written the night before. Then I deleted thousands upon thousands of emails, text messages, and photos that were keeping me from fully grieving and healing. I restructured my entire life from that point forward (remember, total surrender). I put Jesus Christ front and center, in all things, for always. Next was my daughter. She's a blessing I'll never deserve, and I made it a priority to make sure I covered my life, and hers, with the character of Christ. Then was my family. Years of too many unreturned phone calls and solitude had to stop. Then I started pouring out my love and compassion to my friendships, my small group, and my church. I started to really value and cherish the relationships God had blessed me with. God saw my heart and went to work. Life didn't suddenly become perfect, but it got easier, each day, as I replaced old habits with new ones, and made Christ the center of all my decisions. God started a transformation in my heart, and has me on a relentless pursuit to glorify His name, and to bring others to Christ. Being a disciple, and a defender of the faith, are the instructions God has written on my heart, and I choose to obey. If you're asking yourself why I'm sharing this story, and why now... it's not for attention.... and it's not a cry for help. I'm far removed from those days, and God holds me in the palm of His hand, and His love, grace, and mercy cover my life, completely. I waited to share this story because I needed time to heal. I needed time to understand. I needed to listen to God when He asked me to be still, and to speak when He asked me to speak. 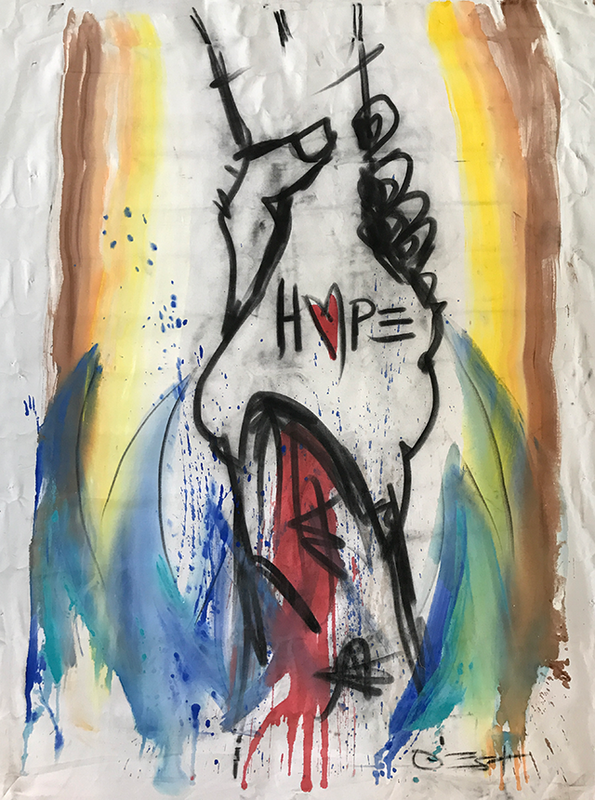 Suicide isn't something I ever thought I would consider, and certainly not something I would expect to be writing about, and sharing as part of my testimony. But not only did suicide nearly take my life, it unfortunately did claim my grandfather's last year. I desperately wish I would have been brave enough to speak out earlier, and recognize the signs, and although I may never fully comprehend why, this ended up being a significant catalyst in my spiritual journey, that solidified my confidence and trust that as the heavens are higher than the earth, so are God's ways higher than our ways, and His thoughts higher than our thoughts (Isaiah 55:9). I challenge you to take the first step, and the first step is placing your trust in Jesus Christ, and inviting Him in to your heart. You don't have to understand it all, and you won't have all the answers, ever. You start with whatever faith you have. Great faith feels like nothing at first, but even faith as small as a mustard seed (Matthew 17:20) allows God to start His work in your life. Let me close by saying this. Depression is real, and you're allowed to feel pain, and experience brokenness, and want answers — but you're not alone. Let me say that again, you're not alone. If you find yourself ever thinking there's no other way, please know that there is, and by the grace of God, I can personally attest to that truth. God's love for me saved my life, and His love for you can do the same thing. I may not know you, and I may never meet you, but as your brother in Christ, I hope you know I'm praying for you, and I love you, with all my heart. Have you ever found yourself asking why some situations in life are easier to navigate than others? Aren't there times when you feel like you have it figured out, then life throws you a curve ball, and what got you through one valley isn't getting you through the next? It can be frustrating at first, but this can also reveal a great deal about ourselves, and particularly our spiritual growth and maturity. Max Lucado said that "Equipped with the right tools, we can learn to listen to God." I doubt many of you have trouble finding the truth in this statement, yet many of us choose to ignore it, and wander aimlessly through an unfulfilling life. Why? I know for me personally, I have taken this concept of listening to God for granted for most of my life. There were days where I would make conscious choices to ignore my relationship with Christ, and avoid equipping myself with the right tools to pursue and nurture that relationship. What I didn't realize was that any step we're not taking towards the Lord, is in effect a step away from Him, which has a negative effect on our quality of life. The choices we make determine the quality of our life. Not only has God prepared a table before you, but He has done so in the presence of your enemies. The enemy is already present, and we must rely on God for everything we'll need mentally, spiritually, emotionally, and physically to not only recognize the enemy, but to have the strength and courage to say to the enemy: "You don't have a seat at my table!" The only way you can lose your peace is if you let the devil sit down and eat your food and start talking to you at your table that your Shepard prepared before you in the presence of your enemies. So don't worry about these things, saying, 'What will we eat? What will we drink? What will we wear? These things dominate the thoughts of unbelievers, but your heavenly Father already knows all your needs. Seek the Kingdom of God above all else, and live righteously, and he will give you everything you need. So don't worry about tomorrow, for tomorrow will bring its own worries. Today's trouble is enough for today. The abundant life consists of God's protection, provision, and promises, and as we experience it, we take on the character of Christ, find peace, rest, and a life free from anxiety; however, the only way we're ever going to be satisfied, and live the abundant life, is to be fully engaged and listening to the Holy Spirit. So how do we keep the enemy from taking a seat at our table? How do we become fully engaged and listening to the Holy Spirit? How do we experience the abundant life? Simple. We need practice, preparation, and spiritual discipline. Dallas Willard said that spiritual discipline is "any activity within our power that we engage in to enable us to do what we cannot do by our direct effort." The disciplines you choose to practice can vary, but here are some that have been instrumental in my growth as a Christ follower. Spending time giving thanks, lifting prayer requests, and otherwise talking with the Lord will help you grow in your faith, and will demonstrate your commitment and intentions to the Lord. Prayer doesn't have to be long, or complicated, it's simply time for you to communicate with God. Sometimes I write out my prayers in a journal. Sometimes I say them out loud. Other time I just meditate on them in my mind. There's no wrong way to pray. Say whatever comes in to your heart and give it time. God will use that time to build your prayer life, if you let Him. If you want to draw closer to God, and allow God's will to be done in your life, you must spend time in the Word of God. Like with anything else, if you want to learn about something, you have to study it. This is no different with reading Scripture. What better way to learn about God than to read about Him, and the inspired words He placed on the hearts of the authors. The words really will come alive, but only when you open your Bible and let them. If you don't know where to start, I'd recommend the One-Year New Testament, which breaks the New Testament down into short daily readings. This one can be difficult for some of us. Life is busy, who has time to spend with themselves in silence or solitude? As a single dad I am able to take advantage of this on certain days more than others. But let me say that it's a discipline I encourage you to make time for. Even if it's only a short time in the morning, or late at night when everyone is in bed. For me, I find that the Holy Spirit really is present in these moments when I intentionally set aside time to be still, listen, reflect, and meditate on God's grace, mercy, love, and His Word. Fasting will forever hold a special place in my heart, as it was during my first 21-day fast that I gave my life over to Christ. Oswald Chambers says that "the true inward significance of fasting is that I have turned to God, either on account of my own sins or others, allowing Him to fulfill His purpose in me." Like prayer, fasting doesn't have to be complex. It's not about how often you fast, how long you fast, or what you fast from — rather, it's about obedience to the Lord, and making room for God in your life. You'd be surprised when you fast from something, if you spend time pursuing the Lord, He'll fill that empty space with more of Him. Serving is so important, and despite what most of us think, we're all qualified and called to serve (1 Peter 4:10, John 13:14-15). Whether it's in your church, your community, or abroad, serving is another way to build your relationship and trust with God. As God sees that you can be trusted in the little things (Luke 16:10), you'll find that He gives you more responsibilities. Serving may be as simple as shaking hands, or making coffee, but I promise you that it will elevate your spiritual life in ways you wouldn't imagine. It's through spiritual disciplines that we are able to drink from the living water. By engaging in these practices daily, you will consistently find your satisfaction in nothing but Jesus Christ. 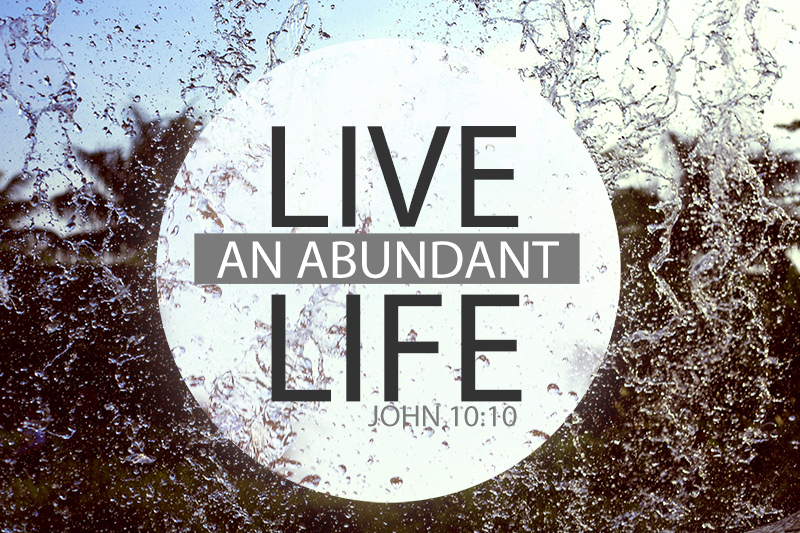 That's the abundant life that Jesus promises us in John 10:10. Beyond living the abundant life, you'll find that others around you will be drawn to you. They'll see the quality of your life and your joy overflowing, and want to know where it comes from. What will your response be? 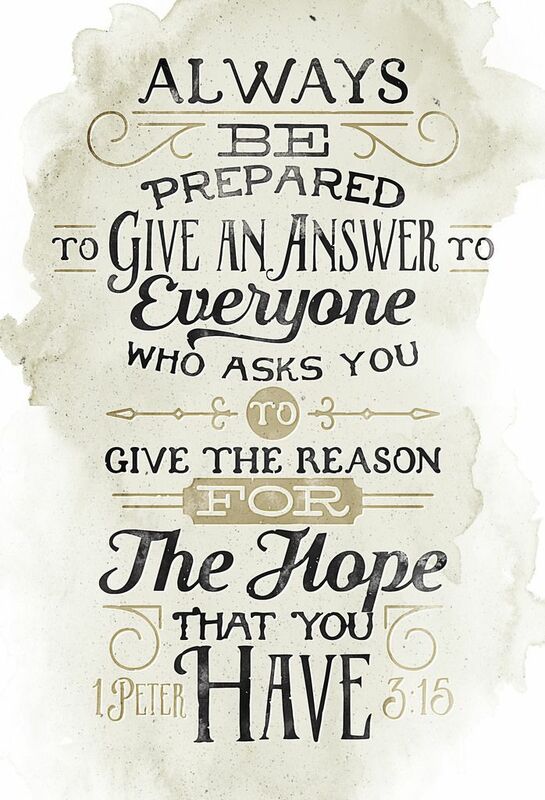 Will you be ready to give an answer? Like the Samaritan woman at the well (John 4), we all have an obligation to share the living water (Holy Spirit; The Good News) with others. Jesus replied, "Anyone who drinks this water will soon become thirsty again. But those who drink the water I give will never be thirsty again. It becomes a fresh, bubbling spring within them, giving them eternal life." Will you reply like the Samaritan woman? Give me this water! My prayer for all of you is that you've asked Jesus to be your Lord and Savior. Over two-thousand years ago Jesus lived the life we should have lived, and died the death we should have died. He did that for me... He did that for you... to pay the penalty of our sins — past, present, and future — and to cleanse us in a way that only a perfect, selfless sacrifice could. Lord, I place my life into Your hands and trust you entirely. I pray that we sacrifice our own desires, die to ourselves, and embrace Your perfect and pleasing will. Transform each of us from the inside out, and characterize each of us with hearts and minds that are focused on You. Let us all commit to becoming Christ-centered in body, mind, and soul.